Exams are possibly one of the most stressful things a person can do. They are very stressful, particularly when they could have life-changing results like jobs. It is important to try and manage exam stress and anxiety, as hard as it might be. The majority of people are going to stress about revision and exams and have anxiety over taking the exam. Although it might seem difficult, being positive about the experience and getting prepared is the best way to help manage the stress. If you have done everything you can for an exam then there is nothing left to do. If you start your revision and preparation for an exam in plenty of time then you can help manage and reduce the stress and anxiety that will start to build up as the exam creeps closer. The best way to start is by making a timetable. Having sufficient preparation resources is also important. Make sure you have done your research around collecting some useful articles from the internet around how to’s, for example how to prepare for exam. Organise your time, write down your plans and manage the rest of your time giving yourself lots of time to learn, revise and prepare for your exams. When planning your time, make sure you plan breaks. Study breaks are advised to give your brain a rest. Taking some time out away from your revision notes and books can help you feel more relaxed and refreshed. During your revision, you should 20 to 30 minutes break every few hours to help your brain refresh and to break up long revision days. You could also plan longer revision breaks throughout the exam period to help take your mind off exams. Exercising will help relieve stress and anxiety which will be particularly high during exam season. Go for a walk, run or cycle o go to the gym to get rid of some stress, improve your mood and help make you feel more productive. If you feel like you’re getting too stressed, a walk outside getting fresh air for half an hour can help relax your mind and refresh your brain ready for more revision. Exam stress and anxiety can lead to bad habits. It is important to try and stay on top of this so no long-term negative effects take control. Make sure you drink plenty of water when revising. When your brain is working hard and you are starting to stress and feel anxious, you can easily become dehydrated without realising. Make sure you eat healthy too; if you’re a snacker then why not swap chocolate for fruit. It is important to have the recommended amount of vitamins and minerals to keep you healthy when you’re busy working all day. You should also try to avoid sugary food and instead eat slow-release foods like bread, pasta, fruit and veg to keep your energy levels right. Get enough sleep to ensure stressful situations do not get out of control. When you are tired, you are likely to become stressed and anxious about things more easily. You should try to get on average 8 hours of sleep at night. If you’re struggling to sleep because of stress, there are lots of great tips and techniques to follow to help you sleep better. From spraying your pillow with lavender to listening to a podcast whilst you try and sleep or having a hot bath before bed, there are lots of tips you can try to improve your sleep. Exams are one of the most stressful times of the year but just remember everyone is in the same boat. And always remember, exams aren’t everything. 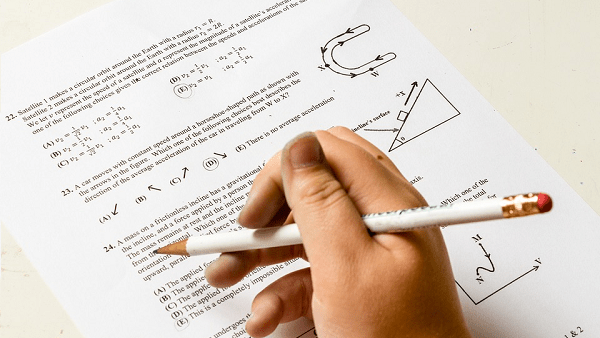 There is so much pressure around exams which is why so many students struggle managing their exam stress and anxiety; however, if the exams go bad, it is not the end of the world. So keep it in perspective, try your best and everything will work out.